Allotment gardens in Colney Butts. The football pitch was a gravel pit until 1922. This area of south-west Watford was covered in similar pits, extracting the sand and gravel which had been deposited on the underlying chalk. 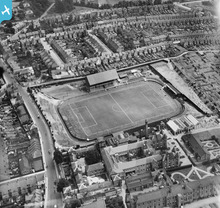 60 Vicarage Road, "The Workhouse". 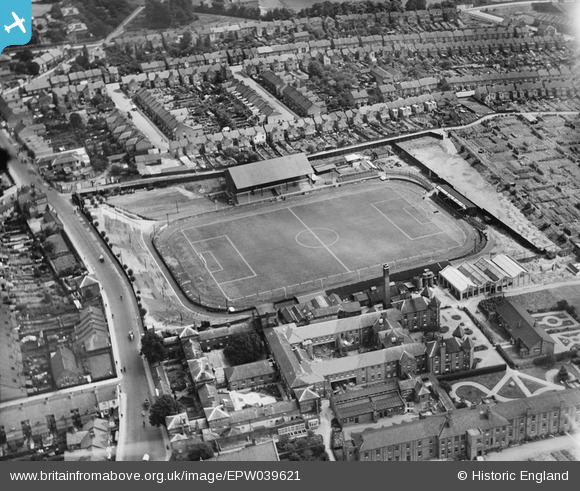 A good, clear view of the 1923 Vicarage Road ground and home of Watford Football Club for almost a decade when this photo was taken, looking almost due east. In the foreground is the old 1838 Watford Union Workhouse, referred to on maps of the period as Shrodells Public Assistance Institution (PAI), which had been expanded in the late 19th century. In the 1940s, Shrodells PAI became part of the Wartime Emergency Medical Scheme, with 578 beds and a further 198 EMS beds. Under the National Health Service in 1948, Shrodells Hospital contained 464 general beds and was to undergo huge changes over the next half century, as it became part of Watford General. Most of the streets labelled on the image were laid out by 1895.